Legsdin: family name of Latvian origin. Original spelling: Legzdins (m), and Legzdina (f). Diacritical marks have been removed for ease in viewing. Pronunciation: "legs," as in what you walk with; "din," a synonym for noise. It is rumored that the name originates from a word meaning "hazelnut tree." Quote of the year:Any society that would give up a little liberty to gain a little security will deserve neither and lose both. Usually attributed to Benjamin Franklin, who denied saying it. For details, see the Wikipedia web page. Recommended reading: The Omnivore's Dilemma. 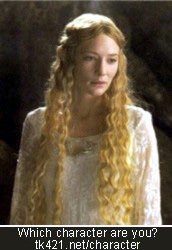 Click on the image of Galadriel, it'll take you to a page where you can take a quiz to find out which fantasy/sci-fi character you're most like. Evidently I'm like Galadriel.